That moment when the congestion that had been clogging your mind drains away and you bask in the clarity of cohesive thought once again. I began watching the initial episode of MasterChef last night (mind you, this is still in my addled state of bacterial debilitation). I wouldn't call myself a sucker for ALL shows where contestants are eliminated one at a time on a weekly basis, but there are certainly quite a few of these "reality" shows that I will plug into (particularly when I feel no need to be thought-provoking). However, the opening episodes of these shows are hardly worth watching unless you are into schadenfreude (which so many of us are, which is why this continues year after year). For the following rant I am referring to MasterChef, but you can insert any of these types of shows into this same argument. Prior to the first presentation to the judges, where it will be determined if the contestant (who already made it through several rounds of "judging") will make it to the big show (to Hollywood, to Vegas, to the MasterChef kitchen...) you are inevitably given some tidbit of back-story to this "character" (because let's face it, there is some scripting to this even if the "show" wants us to believe decisions are made on the fly). Character A: Chaz A. Douchebag is a self taught cook, skateboard master and High School senior. "I am going to win this whole fVcK"^& thing! Ain't no one going to ^%&#$ stop me! I am the &^#*# best!" I know, wrong show. But you get the point. ﻿Character B: Little Susie Sappyface is here wearing her mother's apron. Susie had given it to her mother on her 100th birthday. On that day, her mother rescued 473 orphans from a burning building, single-handedly apprehended the arsonist who had fled the country to jungles of Africa, and took each of the children into her own home to cook each of them a personalized seven course meal. Her mother died that evening in Susie's arms. This was last night. Susie also has brain cancer and has been told she has three days to live. And she's blind. And deaf. And has never cooked in her entire life. 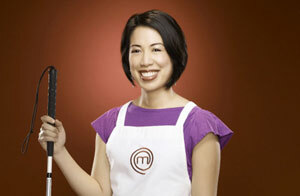 I am not mocking Christine Ha, nor do I doubt her cooking ability, but the picture matches my purpose. There always needs to be a hook. The winner is not likely to be Steve, a 34 year old man from New York who is happily married, has two children, a steady uninteresting job, supportive parents, and is generally happy with life. I made it through less than half of the opening episode before retiring to the bedroom to slink under the covers and dive back into The Blinding Knife (currently at 459 / 727). If I'm going to find out exaggerated back-stories, secret plots, and twists and turns, it might as well be in a format where it's not marketed as "reality" and where the good guys don't necessarily always win. I'm not sure how many episodes of Masterchef you've seen so far this season, but I feel that this current is the most scripted season yet. Contestants are clearly saved for their drama and conflict value. This season's cast also seem to have way more conflict in them compared to previous seasons. I'd cry foul on this but recently my country made its very own version of the show and it was extremely bland (and not just the food). 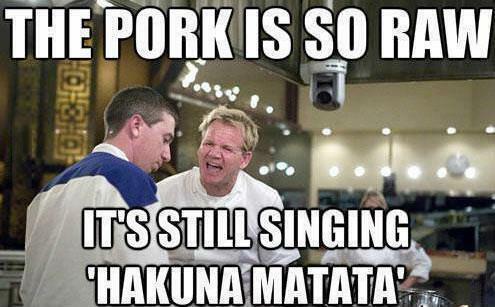 Good food, conflict, and Gordon Ramsay apparently is the recipe (pun intended) for good TV!! Yes, now that the "auditions" are over I have been watching again. MasterChef always seemed to be one of the worst in terms of seeming scripted. I completely agree about people being saved for drama and conflict value. It is mildly ridiculous. Who didn't see the setup of the BurgR segment coming? Not sure how the other judges are in other countries (I think several countries run versions of MasterChef), but the American version judges are just so over the top. Everything they say has the air of script to it. And they all end up mimicking Godon's... way... of... speaking. The most... beautiful... Walmart... steaks. "Gordon, we have 2 hours to fill this episode, but only 1 hour of content. We need you to stall as much as you can." Yet, I will watch week after week. I'm a sucker for these types of shows. Next Food Network Star is on now too.